The present day Karmapa, Trinley Thaye Dorje (born in 1983) was recognized by Künzig Shamar Rinpoche as the official reincarnation. Shamar Rinpoche is the second highest teacher of the Karma Kagyü lineage and responsible for the identification of the reincarnated Karmapas. In early 1994, at the age of 11, Gyalwa Karmapa was able to leave Chinese occupied Tibet and was brought safely to India. 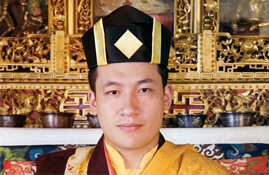 Since then the Gyalwa Karmapa has lived in India, where he has completed his basic spiritual training under the guidance of Künzig Shamar Rinpoche. This training covered the entire Buddhist cannon of theory and practice. In 2003 he received the title of Vidyadhara, that marks the formal completion of a cloister education. At the same time he studied a normal modern education and amongst other subjects Western philosophy and several languages. In 2000, at the age of 17, he visited the West for the first time where he was met by 6000 students in Germany. Since then he has visited his Western students and centers regularly. Conversely Buddhists from all over the world travel to the traditional ceremonies lead by the 17th Karmapa. The Karmapa feels a strong connection to the Western world and through the use of modern communication technology keeps in close contact with his students. 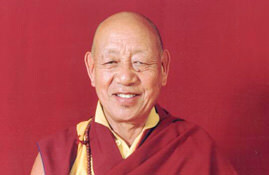 Kunzig Shamar Rinpoche is the second highest teacher of the Karma Kagyu lineage. The line of his incarnations has always been very close to the incarnations of the Karmapas. 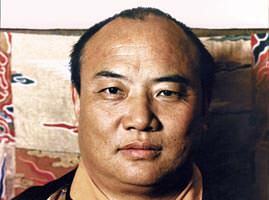 This gave him the name “Red-hat Karmapa”. In 1959 Shamar Rinpoche together with the 16th Gyalwa Karmapa had to leave his home in Tibet due to the Chinese invasion. 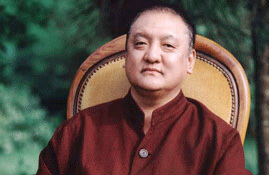 Up until 1979 he received all the transmissions and teachings of the Karma Kagyu lineage from the 16th Karmapa. After that he travelled all over the world teaching Diamond Way Buddhism. The 14th Shamar Rinpoche, Mipham Chokyi Lodro, passed away on June 11, 2014. 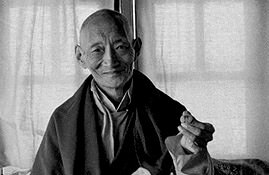 Lopon Tsechu Rinpoche passed away on June 10, 2003. Kalu Rinpoche was born in Kham (East Tibet) in 1905. At the age of 11 he was ordinated and at 16 he started a 3 year retreat. At 25 he went into the mountains of Derge and lived there as an ascetic for 15 years. He recieved the full transmission of the Shangpa and the Karma kagyü schools. Afterwards he became a Retreat Master. Upon the request of the 16th Karmapa he left Tibet in 1955. Hannah and Lama Ole Nydahl were sent to Kalu Rinpoche to complete their basic practices (Tib. Ngondro) at the end of the 60’s by the 16th Karmapa. They met him for the first time when Kalu Rinpoche was aged 67 and proceeded to organise his trips in the West. In 1983 they received the Rinchen Terzo transmission (Treasures of the Nyingma – transmission).